Chicago has always been a city of tall buildings with the Sears Tower Willis Tower still boasting as the tallest building in America – years after it was constructed. This long celebrated period will come to an end for the Willis Tower after the completion of the Chicago Spire, a 150-floor residential building. This magnificent residential building was designed by the renowned Spanish architect Santiago Calatrava and was developed by Garrett Kelleher of Shelbourne Development Group Inc.
Once completed, the building will be a 2,000-foot tall spiraling tower with 150 floors and will also include an underground 5-floor garage. 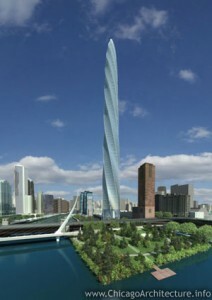 The completed structure will have a base-to-height ratio approaching one to ten, making The Chicago Spire the most slender super-tall building in the world. The biggest obstacle to completing this building was the zoning requirements. The parcel of land selected was only zoned for a 540-foot tall building and a 350-foot tall building. However, the developer managed to assuage the city, neighborhood groups, and local open space activists by developing a riverfront plaza with six stories of parking underneath.